Grinnell College is a private liberal arts college in Grinnell, Iowa, U.S. known for its rigorous academics and tradition of social responsibility. It was founded in 1846, when a group of New England Congregationalists established the Trustees of Iowa College. In its 2016 edition of "America's Best Colleges", U.S. News & World Report ranked Grinnell tied for 19th among all liberal arts colleges in the United States, and tied for highest economic diversity as measured by low-income students receiving federal Pell Grants. In 1843, eleven Congregational ministers, all of whom trained at Andover Theological Seminary in Massachusetts, set out to proselytize on the frontier. Each man pledged to gather a church and together the group or band would seek to establish a college. When the group arrived in Iowa later that year, each selected a different town in which to establish a congregation. 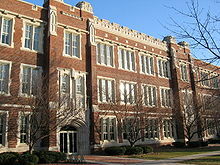 In 1846, they collectively established Iowa College in Davenport. A few months later, Iowa joined the Union. The first 25 years of Grinnell's history saw a change in name and location. 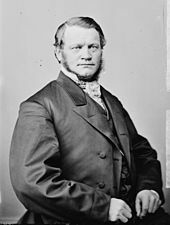 Iowa College moved farther west from Davenport, Iowa, to the town of Grinnell and unofficially adopted the name of its benefactor: an abolitionist minister, Josiah Bushnell Grinnell, to whom journalist Horace Greeley supposedly wrote "Go West, young man, go West." However, Greeley vehemently denied ever saying this to Grinnell, or to anyone. The name of the corporation "The Trustees of Iowa College" remained, but in 1909 the name "Grinnell College" was adopted by the trustees for the institution. In its early years, the College experienced setbacks. Although two students received bachelor of arts degrees in 1854 (the first to be granted by a college west of the Mississippi River), within 10 years the Civil War had claimed most of Grinnell's students and professors. In the decade following the war, growth resumed: women were officially admitted as candidates for degrees, and the curriculum was enlarged to include then-new areas of academic studies, such as natural sciences with laboratory work. In 1882, Grinnell College was struck by a tornado - then called a cyclone, after which the college yearbook was named. The storm devastated the campus and destroyed both College buildings. Rebuilding began immediately, and the determination to expand wasn't limited to architecture: the curriculum was again extended to include departments in political science (the first in the United States) and modern languages. Grinnell became known as the center of the Social Gospel reform movement, as Robert Handy writes, "The movement centered on the campus of Iowa (now Grinnell) College. Its leading figures were Professor George D. Herron and President George A. Gates". Other firsts pointed to the lighter side of college life: the first intercollegiate football and baseball games west of the Mississippi were played in Grinnell, and the home teams won. As the 20th century began, Grinnell established a Phi Beta Kappa chapter, introduced the departmental "major" system of study, began Grinnell-in-China (an educational mission that lasted until the Japanese invasion and resumed in 1987), and built a women's residence hall system that became a national model. The social consciousness fostered at Grinnell during these years became evident during Franklin D. Roosevelt's presidency, when Grinnell graduates Harry Hopkins '12, Chester Davis '11, Paul Appleby '13, Hallie Flanagan '11, and Florence Kerr '12 became influential New Deal administrators. What are the academic rankings for Grinnell College? 1. number 114 for Academics. 2. number 123 for ROI (Return on Investment). 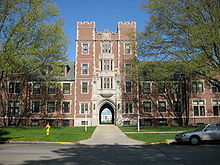 What universities are similar to Grinnell College?